When you have a property that you either do not want or can’t afford, you have a few options. If at all possible, avoiding foreclosure and bankruptcy is always paramount to ensuring that you maintain good credit. At Will Close Fast, we hate to see our fellow Missouri residents get behind on their mortgage and offer a quick solution for selling your house fast. Paying in cash, we buy homes in St. Charles, St. Louis, and throughout Missouri. Today, we want to go over three different options you have to get rid of unwanted property. 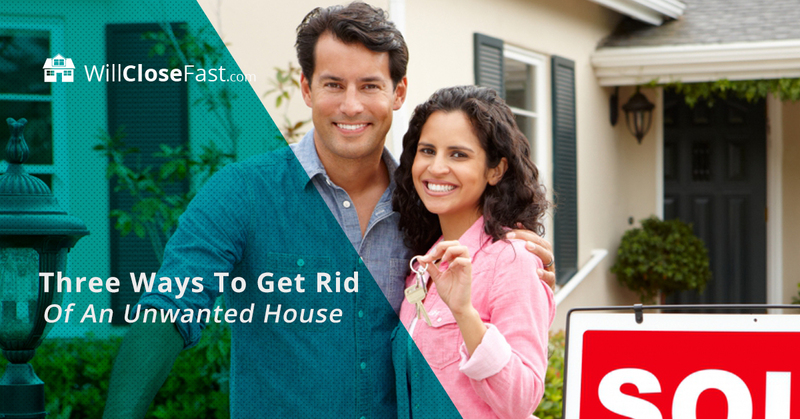 Want To Get Rid Of Your House Fast? We'll Give You Cash! During a short sale, a lender agrees to allow you to sell a house for less than you owe on the mortgage. These sales are notorious for taking a long time to close – sometimes over a year – and often fall apart at the last minute. Because you are selling your home for less than you owe, you might find yourself paying the difference between the closing price and the remaining amount on the mortgage. Talk to your lender to see if you can come to an agreement to avoid this. Keep in mind that this often damages your credit score almost as much as a foreclosure. However, this process saves you the cost and fees associated with a foreclosure and will usually allow you to secure a new mortgage sooner than if you had foreclosed. If the foreclosure process has already begun, you can negotiate with your lender for a deed-in-lieu of foreclosure. In this situation, a homeowner transfers the title of the property to the lender or bank with the agreement that the lender will cancel for foreclosure. This rids you of responsibility for your mortgage but is generally only agreed to if the house has remained in good condition during the time you owned it. Like a short sale, deed-in-lieu of foreclosure can also damage your credit score. The last option is to avoid going through the banks by selling your house for cash fast. Will Close Fast – true to our name – usually closes within 7-10 business days. We take no commission and give you cash on the spot. Additionally, we buy houses as-is, regardless of condition, with a fair cash offer. There is no waiting period for approval from the bank or the buyer as, again, we pay in cash. If you need to get your house off of your hands, we want to help. To offer the best service, we move quickly and guide you through the entire process when we buy houses. St. Charles to St. Louis to Franklin St. Clair and everything in between, choose Will Close Fast as your trusted house-for-cash buyers.